A weapons' replica is a precise copy of a previously made piece of armament, produced from the same material or its cheaper counterpart. It should have the same size as the original and be created using the same technique. A copy should be tagged so as not to constitute a counterfeit (the name of the copy's author is known). Replicas may have teaching or collector's function. They might be also created in order to protect the original work. For instance, a copy of a monument or sculpture is exposed outside, and the original remains in the museum. Pic. 1. A replica of a Greek sword. When it comes to the ancient Greek soldier's armament, the most common association is the so-called hoplite sword of a leaf-like shape. However, the most common weapon at that time was the Greek kopis. It was this sword to spread most widely across the Greek islands, as well as in the other areas under their influence. Even the consistent enemy of Greece, Persia, liked this kind of weapon. It is certainly because of the sword's remarkable efficiency. It made it possible to cut bronze helmets and destroy wooden shields. Its blade measured usually 20,32-55,88 cm. Another weapon used by the ancient Greeks is makhaira. It was a sword equipped with a single-edged, curved blade. It had a narrow shape at the beginning and gradually expanded into a leaf-like form, with a sharp spike at the end. Makhaira is sometimes referred to as a “long knife”, but taking into account its size and usage, this is a completely wrong term. This weapon was commonly depicted in the red-figure vase painting, especially at the times of the Persian wars. The so-called Ilioupersis, meaning the last night of Troy, was one of the most favourite subjects then. Even some of the gods, such as Apollo, were carrying a makhaira with them. There is also evidence that such a weapon was also used by the peltasts, which were the light infantry of Thrace and Paeonia. Makhaira remained in use even after the fall of the Hellenistic states. Although the Roman army used different weaponry, in the Byzantine Empire makhaira was reintroduced. It was an infantry weapon mostly, but the occurrence of highly decorated long copies testifies to the fact that it was also used by cavalry. Makhaira was fought with up to the fall of the Byzantine Empire. At the beginning of the fifteenth century, the armourers brought back the closed bail to this weapon, in accordance with the ancient Greek practice. The former makhairas have an open bail form. Gladius was well-suited as a close combat sword, for fighting behind a wall of shields called scutum. It performed well also when the clash turned into a crowd of individual duels. As it appears from the ancient messages, this weapon was mostly used for stabbing. In this way, the probability of killing the enemy was increased, while cutting often only wounded him. Legionaries were trained in such a way so that they could aim blows in the most critical areas of the human body, allowing the point of a blade to reach the most important organs. The Roman sword from the period of the republic was remarkably slender, long up to 76 cm and it had a surprisingly prominent sharp point, which was ideally suited for thrusting. Gladius was made by welding steel and iron layers which varied in the level of carbonization. It was created in such a way that apart from thrusting, it could be also successfully used for cutting. His excellent balance and very low weight enabled more efficient fighting. In the ancient sources, there are many descriptions of the enemies' body parts having been cut off. The Macedonian phalanx, boasting with numerous battle successes and bristling with sarissas, was repeatedly smashed by the legionnaires, what left virtually defenseless soldiers to be massacred by the Romans in a hand-to-hand fight. Gladius performed well in battles with Gauls as well, because their long swords made it difficult for them to fight in a close combat. The Marian reforms (late second century BC) turned a legion into an even more universal formation (a cohort took the role of the primary tactical unit) and unified the infantry weapons more precisely. From this moment on, every legionnaire had a helmet, chain mail, a shield, a heavy javelin and a sword, whose form was changed in the I century BC. The blade was shortened, while the cutting edges began to converge in the middle section of the weapon, which became more massive in general. This is the so-called Mainz gladius. Early Empire brought another modification of the Roman sword, namely the Pompeian type. The blade was even more shortened, while the cutting edges were made parallel to each other. Presumably, gladius was shaped in this way in order to make it more versatile and better suited for cutting. However, the form of a hilt was maintained, with a cover from an organic material, mainly horn, wood or bone. It had a semicircular cross-guard, with a grip ideally suited to the fingers and a massive round-shaped pommel, what made it easier to pull a weapon out after thrusting. A legionnaire wore a gladius attached to the right side of the special belt called balteus, and the officer – to the left side. Both of them had also a short dagger called pugio. In the late Empire era, a long sword called spatha got more popular, although previously it was used only by the cavalry. It is this weapon that was the prototype of the early Medieval sword. A sword was the most important weapon for the Vikings. 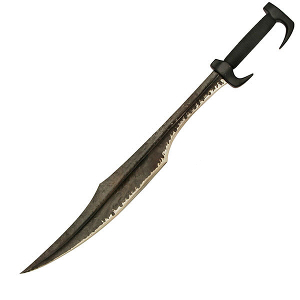 The one-handed variant had one or two-edged blade made of iron, a hilt, a cross-guard and a blade as the top end. The one-sided blade was used at the territory of Norway, in the early Viking era. It was one meter long and it was mainly used for cutting and stabbing. Its weight exceeded the weapon from the Merovingian period. The two-edged blade reached 80-90 cm and it was usually 5,5 cm wide. A low and wide fuller was placed on its whole length. As the years went by, the blades were made lighter, so as to perform better in a close combat. By merging hard steel with soft iron, using multiple methods, the blade was given a particular pattern, which served both as a decoration and a highest-quality proof. The Franks manufactured this type of blade, mostly near the middle of the Rhine (specific centers failed to be have been located so far). The written sources show it that this was the place where the swords to the areas inhabited by the Vikings were exported from. Charlemagne forbade selling any weapons to the Normans or any other hostile peoples. It was confirmed by Charles the Bald, who in 864 wrote it in the Edict of Nantes that the trade of weaponry with the Normans was a betrayal of the nation, which would be punished by death. The Frankish origin is proven by the Latin inscription ULFBERHT, appearing on multiple exemplars. This is probably the name of a blacksmith, which became a status mark with time. That inscription was put using wire inserts. However, hundreds of the swords signed in this way have survived to the present, so they could not have been produced by a single blacksmith only. What is more, the oldest Ulfberhts date back to 850 AD and the latest ones – to the twelfth century. It suggests that either the name was conveyed or other workshops were making copies of this weapon. It is assumed that the blades were passed down from generation to generation, changing the hilt only. The quintessence of the quality of the weapons was the processing of steel, as well as the carbon content in excess to the composition of the steel and the new form of the blade. The center of gravity was moved to a place near the hilt. It made the sword easier to operate, what created new possibilities in fighting. Most Ulfberhts have been discovered at the whole territory of the Northern Europe, particularly in Finland and Norway. There were also swords with different names of the craftsmen, such as Inno, Leutfrit czy Ingerli, preceded with the words ME FECIT or, in the case of the Ukrainian exemplars, KOVAL. Moreover, the information about an owner can also be found sometimes; whereas Christianity was distinguished by an inscription IN NOMINE DOMINI. Even though the Viking sword was obtained thanks to the trade with the Carolings, the finishing was usually made on the spot. It can be proven by the fact that the moose antlers were used to make the hilt and that the characteristic Nordic ornaments were added, as it can be seen on Sigtuna sword from Sweden. No hilts made of bronze or steel have been found so far. The embellishments of the non-ferrous metals were the presentation of the blacksmith's craft. Such swords were the symbols of prestige and power, therefore, they had a representative role. The upper end of a blade was equipped with a hand-long hilt, while just behind the blade, a cross-guard was assembled. As the cover was made of bone or leather, it is difficult to find a well-preserved exemplar. The basis of the blade was a bent or straight rod. The crown of a pommel was placed on it or riveted directly to the end of a blade. The pommel could have a semicircular, triangular or multi-part shape. Later, the two-piece pommels were replaced with single-piece ones that did not need any fixing rod. The guards were extended from 10-11 cm up to 16-17 cm. The Templar weapons were longswords, commonly called hand-and-a-half swords. This name derives from the classification problem associated with this kind of weapon. Namely, it has a much longer hilt than the one-handed swords, but at the same time shorter than the one of the two-handed weapons. This allowed to put a second hand, but often it was not a full grip, because the hand was based partly on the hilt, and partly on the pommel, or even fully on the pommel itself. Pic. 4 A replica of the sword of knights templar. Due to its versatility, this weapon gained immense popularity in the late Middle Ages. It could be used both by the infantry and cavalry. Between the fourteenth and fifteenth centuries, an armor plate became more common, along with the half-sword technique. One hand should be put on the hilt and the other one in 1/2-2/3 on the pommel, what allowed to thrust very precisely and strongly. It proved very useful in a close combat with an opponent who had an armor plate. What is more, it enabled the warrior to damage the enemy with a guard or a pommel. Such a weapon was remarkably effective in hands of an experienced warrior. Apart from battlefields, it was used in duels. A long sword has been the most popular weapon in the Middle Ages and modern fencing treaties. Pic. 5. Replica samurai sword - katana unusual. Katana is a classical samurai sword. It measures 2-3 shaku (1 shaku stands for 30,3 cm), referring to the part with a blade. It has similar qualities as a sabre. Its blade is curved and single-edged, in order to cut more effectively. A hilt of an oval cross-section is relatively long, reaching approx. 30 cm. It leans slightly towards the blade's pivot. It is possible to grab it with both hands, what stems from the fencing technique and the method of cutting blows. 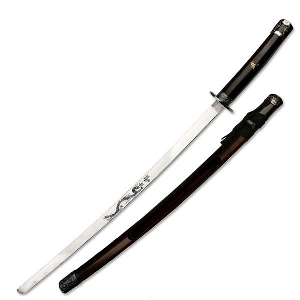 The katana sword was carried differently than other forms of long cold steel – it was put into a sheath and slipped under the belt from the left, in a rather horizontal position, while wakizashi was attached at an angle and with the hilt facing upwards. When a samurai entered the house, he put down his sword in an honorable place in the form of a special rack called a katana-kake. The same as when it was carried, katana was laid in a position aiming the blade upwards. Therefore, comparing the sword on a rack with the blade aiming downwards to a Tori gate is wrong. In case of a travel, this weapon was protected in a specially prepared bag that shrouded katana over its entire length, along with the hilt. The most significant exemplars were covered in a case called katana-zutsu. In the globalreplicas.com store you can find a wide range of marvellous copies of historical weapons, used from the ancient times up to the present. Every replica of a sword or a gun is made very precisely and realistically. Thanks to the use of the best materials available and exact imitation of any detail, on the basis of the museum exhibits, we can guarantee the highest-quality of the offered products. Our cold steel copies will constitute a great complementation of every collector's set. 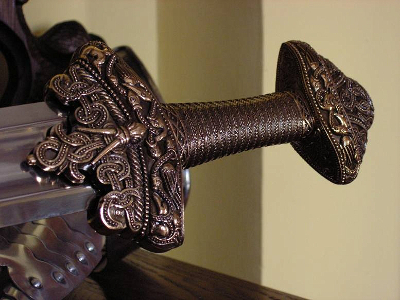 However, a sword replica is not only a collector item, but a stunning interior decoration as well. Each of them is extremely durable and robust, at the same being indescribably beautiful. No cold steel lover will be disappointed with our offer, as we are selling swords which are the precise copies of the original artifacts. They will certainly make an unusual and exceptional gift. Moreover, they constitute a kind of a prestige symbol or a sign of a good taste and an original passion.